excellent design provides Flexibility with regard to existing spatial conditions. After the raw materials flow into the hopper, grains begin to rub against each other under the action of the roll rotor and screen jacket. When the product achieves certain accuracy, the product will flow out from the outlet. Meanwhile, high-pressure wind is sprayed into the hulling chamber continuously; it enhances the polishing process and takes away part of the heat. It produces corn with a shiny, uniform, dust-free and low temperature finish. 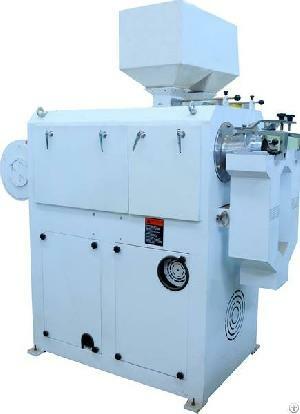 This machine is a special equipment which is mainly applied for corn hulling, de-germinating, polishing. It is the most ideal machine for small and medium-sized corn processing plants. It can also be used in rice processing line after modification.